‘Tis the season, when families come together, exchange gifts, prepare lavish feasts and eventually all curl up in the living room to watch a classic Christmas movie. The movies that are shown this time of year are very specific in their genre, not just because they feature common characters such as elves, Santa Claus, reindeers or angels, but because they feature common themes such as hope, love, giving, kindness, charity and gratitude. Yale Psychologist Paul Bloom has argued that stories (not just Christmas stories, but stories in general) are one of the primary mechanisms for making society “nicer” as there is no better way to convey certain lessons about the benefits of kindness, charity and love. And Christmas stories are probably at the top of that list, each one with its uplifting message and some call towards enlisting our nobler selves. 1. Rudolph the Red-nosed Reindeer: Starring Rudolph as the quintessential awkward adolescent who is different from all the others by virtue of his shiny red nose. 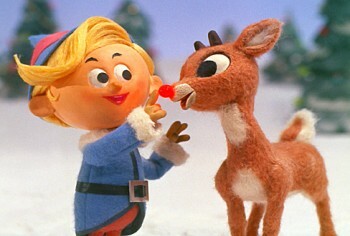 But Rudolph becomes the star of the show when he learns how to put his differences to use, and finds that his greatest weakness becomes his greatest strength. This story clearly links to recent research on “character strengths and virtues” but since I already wrote extensively about “Putting your Strengths to Work” in a previous article, I won’t go into detail on that here. This movie is also a good example of Bloom’s idea that stories help society to become nicer. It serves as a reminder to appreciate the differences and diversity in others. Movies like this help us to overcome natural heuristics that predispose us to stereotype against others. 2. Miracle on 34th Street: A kind department store Santa, who goes by the name of Kris Kringle is brought to trial in an attempt to institutionalize him for insanity because he appears to believe he is the real Santa. The movie plays out the battle between two forces, those who believe in uncovering the truth, even if it hurts us, and those who prefer to celebrate hope and faith, even if it means the truth has to be bent slightly. This debate goes on today in positive psychology, as researchers study the benefits of hope and optimism but are cautioned to maintain a “realistic optimism” that does not distort reality in a harmful way. There are those who are quick to point out the values of pessimism and the possibilities of being misguided by optimism, but there is also a growing body of evidence that highlights the benefits of leaning towards a more hopeful and optimistic outlook on life. Some would argue that we should evaluate our beliefs, not only on the merits of their veracity, but also on “how those beliefs serve us.” And so if a belief in Santa Claus causes no harm, but it allows you to experience the magic of Christmas and become a better person for it, by all means leave the cookies out on Christmas Eve. 3. It’s a Wonderful Life: In my favorite Christmas classic, George Bailey is rescued from his own suicide attempt by an angel who teaches him how valuable he has been to his family and community by showing him what their life would have been like without him. Some researchers explored this theme, testing to see if “mentally subtracting positive events improves people’s affective states.” Participants did not predict their mood changing positively (intuitively you would think imagining loss would make you sad.) But subjects felt better when they imagined what their life would have been like without certain positive events. The researchers actually called the effect in their study “the George Bailey effect” in honor of the character from the movie. Sonya Lyubomirsky, psychologist and author of “The How of Happiness” wrote an article based on this research entitled “What If I’d Never Met My Husband?” She suggests that imagining being without the good things helps us to appreciate those things as if they were new again. A sense of novelty is restored, and novelty, surprise and mystery are all important to our wellbeing. As you enjoy your family this holiday season, imagine them not being around, or imagine you d0n’t have your home, your job, your kids, etc. You might realize you already have the greatest gifts of all, without ever unwrapping a box. Naturally, I could go on and on, and maybe next year I’ll pick up where I left off, covering “A Charlie Brown Christmas” with research on resilience and flow, “The Christmas Carol” with research on kindness and generosity, or even the original Christmas story about Jesus Christ, which links to research on forgiveness, mercy and compassion. In the meantime, there is an argument to be made for not analyzing these films too much and just enjoying them for what they are. Just don’t skip them altogether, as these stories play an important role in reminding us what Christmas is really all about. Buckingham, M. (2007). Go Put Your Strengths to Work: 6 Powerful Steps to Achieve Outstanding Performance. Free Press. Lyubomirsky, S. (2007). (The How of Happiness: A Scientific Approach to Getting the Life You Want. Penguin Press. Peterson, C. & Seligman, M. E. P. (2004). Character Strengths and Virtues: A Handbook and Classification. Oxford University Press. Seligman, M. E. P. (2006). Learned Optimism: How to Change Your Mind and Your Life. Vintage Press. Snyder, C. R. (2000). Handbook of Hope: Theory, Measures, and Applications. Academic Press. Good stuff. Don’t forget my favorite “The Little Drummer Boy” next year. As a mom of 5 month old twins boys, I’ve welcomed the Christmas carols playing nonstop on one local radio station along with several genre options streaming on Pandora. As a new mother, I quickly realized how shallow my mental music library was. I knew a few lines from a lot of songs so often found myself humming my way through various tunes in my attempts to soothe my sons. The joyful songs of the holiday season have come to my rescue. They brighten my mood amidst the mayhem of mothering multiples. The emotional contagion spreads to my boys. This evening one of my boys was humming along from his car seat as we drove. I didn’t anticipate just how much I would enjoy getting to partake in playfulness as a parent. Thanks Jenny, you are so right about the Christmas music, I feel the same way. What is interesting though is the “sense of place” required to enjoy it. Listening to Christmas songs in June does not have the same effect, but they do seem magical in December. The same thing happens with Hawaiian music. Nothing is more magical than listening to Hawaiian music while sitting on a beach in Maui sipping a Mai Tai. But listening to it while stuck in traffic on the 405 freeway doesn’t seem to have the same effect.